There’s something very cool about Google Now, which the company announced at its I/O developer conference a few weeks ago. At the same time, though, Now also has the potential to become Google’s creepiest service yet. 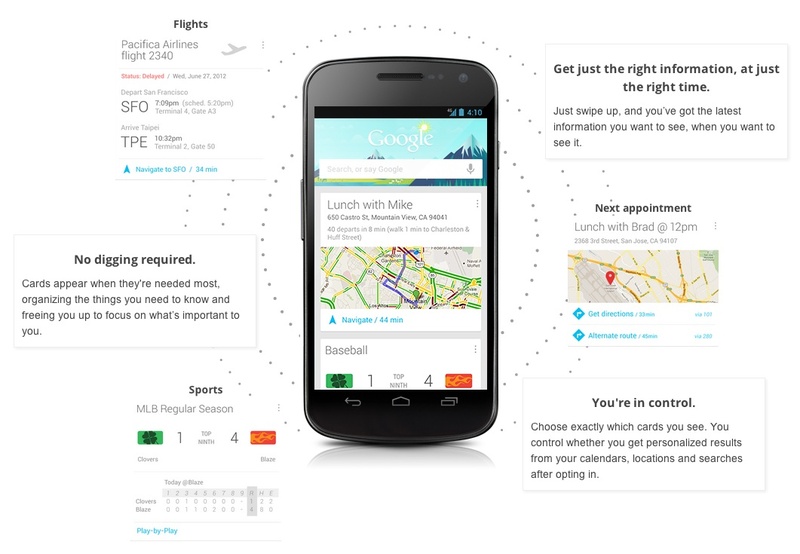 Here is what it does (assuming you opt in to the service and have a phone or tablet that runs Jelly Bean): Google Now learns from your search behavior and shows you cards with information you regularly search for (think game scores of your favorite teams, flight schedules) or that could be relevant to you because of your current location, including weather, nearby restaurants, schedules for the next bus station, how long it’s going to take you to drive home and currency information if it finds you are in a different country. It also uses a whimsical theme to highlight the time of day and where you are (it showed an image of Sydney’s Opera House, for example, when I was there a few weeks ago). All of this could easily scream “invasion of privacy.” After all, this is one of the few Google services that really reveal how much the company really knows about you. The reason why it doesn’t quite feel like that yet is because of the limitations of the service. There is so much more Google could do with this service, but it almost feels as if Google deliberately kept some features back for the time being to ensure that users (or at least those few lucky ones who have access to a Jelly Bean device) can get used to how it works before adding more tools. Google says Google Now is meant to give you “just the right information at just the right time.” Having used it pretty intensively both at home and on the road for the last three weeks, I’m happy to report that it works pretty well. When I’m at a bus stop, it will show me when the next bus is supposed to arrive. When I was out of the country, it would automatically show me what time it was at home and the latest currency exchange rate. Back at home, it quickly learned where “home” actually was (it did ask me to confirm this information just to make sure, though) and would then always show me how long the drive home would be whenever I was more than a few miles away. It culls its data from all of your Google searches, no matter where you search (as long as you are logged in to your Google account). After a local search (say for a restaurant or airport), for example, it will start showing you a card with the current driving time to those locations. Do a flight search on Google to see if your flight is still on time and it will start showing you that info in Google Now, too. When you opt in to using the service, Google says Now says that it will access your location data and your location history. The service also “uses data from other sources, such as your data in Google products or in third-party products that you allow Google Now to access. For example, your tablet’s synced calendar may include entries from non-Google calendar products.” Currently, though, it seems like the service most relies on search data and access to your calendar. Despite everything that works well, Now can also be clunky at times. For no apparent reason, for example, it often decided to show me directions and travel times to local restaurants I searched for weeks before Google Now was even available. Unless you use Google instead of Flightstats or other tools to search for flight delays, it will never show you any flight information and because Google Search doesn’t let you search for flight numbers and dates at the same time, it will always show you information for the current date, even if your flight is still a day or two out. It’s easy to imagine a few scenarios where Google could do even more with your data. What if Google Now could look at your email inbox, for example, and automatically detect flight itineraries, hotel reservations and OpenTable confirmations and then use this data to give you more specific information on the Google Now screen without having to first search for it? There are no technical reasons why Google couldn’t do this. TripIt, WorldMate and others already do some of this with emails you send them, for example. That’s apparently a line that Google isn’t ready to cross yet, though. People would likely freak out if Google decided to analyze their individual emails for Google Now, though it obviously already takes a close look at your inbox to target ads anyway. For many, it will already be creepy enough to see what Google can learn about your daily habits based on your search and location history. For now, Google has decided to err on the safe side and with just about a dozen different Google Now cards, it’s a pretty limited service that, despite its promise, doesn’t always offer you “just the right information, at just the right time” (most of the time it just shows the weather card anyway). As Google expands the service, however, it’ll be interesting to watch how long it will take before it starts pushing things a bit too far.